In our backyard, we have two enormous pine trees– I mean like 5 stories tall– that are just the right distance appart for a hammock. In fact, we did have a hammock back there a couple years ago, but it was inexplicably destroyed in freak fight between squirrels and possibly a raccoon. But that’s a different story. 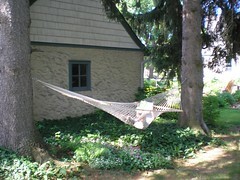 This story is, partly in honor of Father’s day, Annette and Will bought a new hammock. After the weeding this weekend, perhaps I’ll take a nap back there.